The Pound showed some modest gains yesterday, as the bulls welcome recent positive developments surrounding the Brexit but are yet to pass through the final results from the cross-party talks and the EU summit in order to maintain the recent momentum. The current gains were caused by the Cooper-Letwin bill turning into a law and avoiding no-deal Brexit (at least from the UK side). PM May must show willingness to compromise as the talks with the opposition party leader Corbyn will continue today as a final attempt before the April 12 deadline. Moreover, PM May will meet with Merkel and Macron in Berlin and Paris today hoping to find support ahead of the EU Summit on Wednesday. The market sentiment is turning a bit bullish from being neutral for a long time, but traders are still hesitant to go all-in, as the risk of a no-deal Brexit is still possible. On the data front, there seems no major figure coming out from neither the UK or the US. 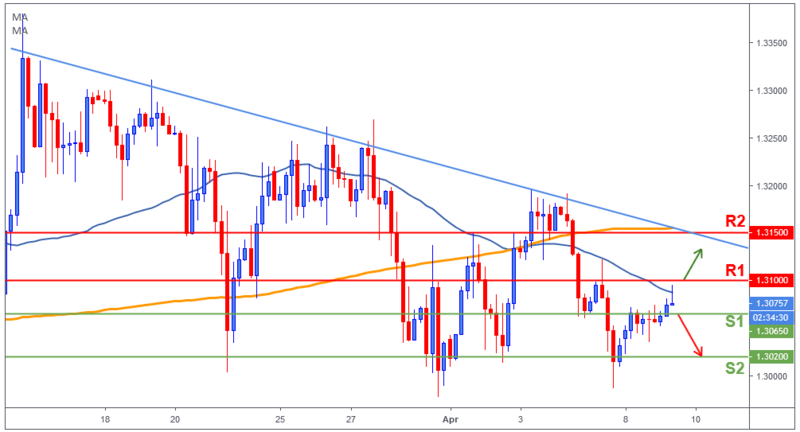 The Pound bulls were able to break above 1.3065 and tested the 50-day moving average (blue line) alongside the 1.31 (R1). If the bulls need to be taken more seriously, they need to gather momentum and break above 1.31 (R1) to confirm their recent strength. However, failing to do so, the Sterling will lose momentum and tumble back below 1.3065 (S1) and could likely revisit 1.3020 (S2).